Listening to music within the home was something that was deeply cherished among Victorians of all social classes. In a world that was limited to objects such as music boxes to reproduce sounds in the home, live music was especially appealing. Many forms of outside entertainment were sought after, including operas, plays, and musicals. While these were wildly popular among wealthy nineteenth-century society, attending these events could prove inconvenient given New England's challenging weather and limited transportation options. Naturally, it made sense to bring the entertainment into one's home, thereby giving rise to the presence of a “music room” within many upper-class Victorian houses. 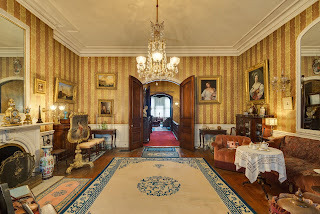 At the Gibson House, the music room is the most lavish room and was a place where the Gibson family regularly entertained guests and friends. The piano became an especially fashionable musical instrument to possess, either an upright or a baby grand, depending on the wealth of the family. Since at the time many popular songs were made available in sheet music form, amateur musicians could play to their guests and family. There is quite an extensive collection of sheet music at the Gibson House Museum, collected over the years by the family. Along with individual pieces, there are bound albums containing a number of miscellaneous works, such as polka music and waltzes. The majority of the music is from the late nineteenth through the early twentieth centuries (1879–1934), and was largely published in Boston. (The name Oliver Ditson & Co. appears often, indicating it was, perhaps, the family’s company of choice when purchasing new music.) The Gibson family’s music collection contains many pieces by well-known classical composers, including works like Fugue in G Minor (The Little) by J. S. Bach and Danse Polonaise by Xaver Schwarwenka, which you can listen to here and here. The Gibson House sheet music collection includes one song that Charlie Gibson composed himself, entitled Dreams. He wrote the words and music in 1922 for the well-known baritone Emilio de Gogorza. According to some notes that Charlie wrote about the Gibson House music room in 1938, de Gogorza came to the house while Dreams was being written and sang it, offering his suggestions for edits. Charlie also noted that his piece had been sung at concerts in Boston and broadcast on a New England radio network. We have records of his attempts to get the piece published by Oliver Ditson & Co., which unfortunately were not successful. During the period 1800–1914, it became common to hold chamber music recitals in upper-class homes. It was typical for both children and adults to play musical instruments, and most families considered music part of a well-rounded education. (This was particularly true for young women, who were expected to be capable of demonstrating their skills when potential suitors and other guests visited the home.) 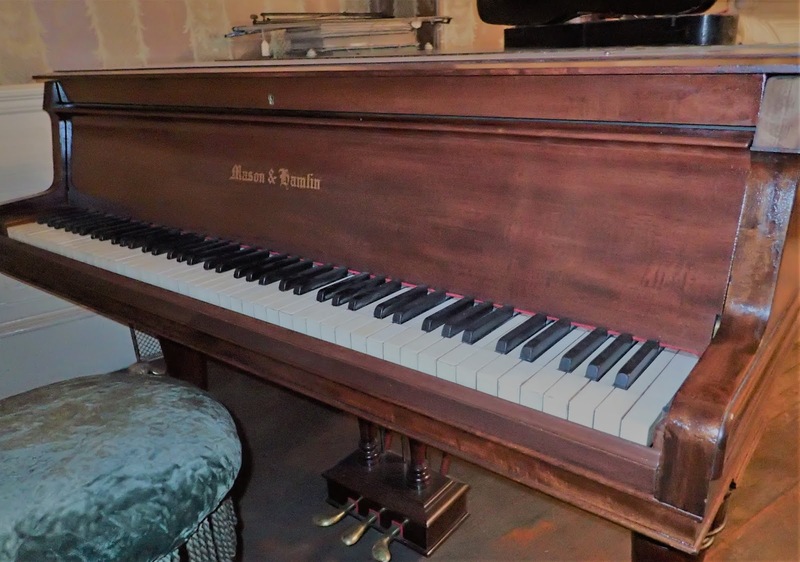 In the case of the Gibson family, Charles Sr. played the flute, Rosamond and each of the couple’s three children played the piano, and Charlie also played the violin. As the music room was an important part of the home, great care was taken to decorate it to enhance the enjoyment of the listeners. Chairs were usually very comfortable, and decorations such as plaster casts of musical composers and pictures and books related to the arts added to the ambience. In the Victorian home, where typical wall colors were reds, greens, or blues, subtler hues were considered more suitable for this artistic room. Walls would often be covered in fabrics such as grass cloth, Japanese cottons, velvet, linens, and sometimes tapestries. 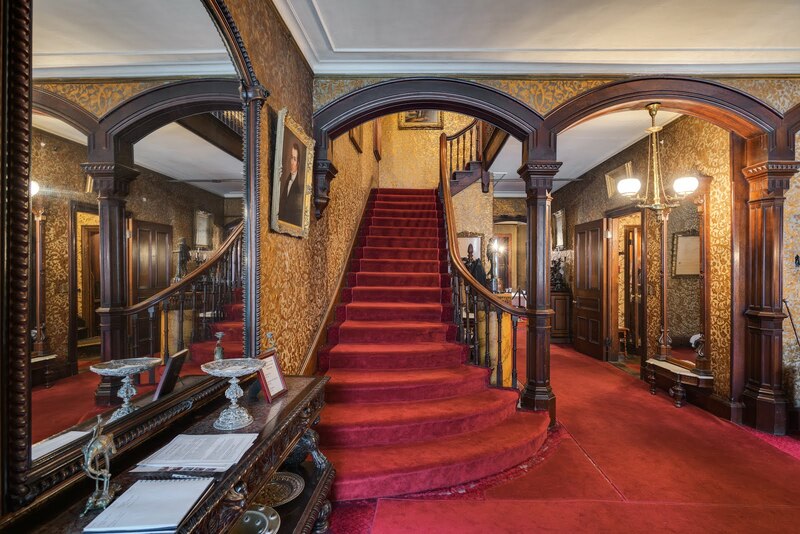 The Gibson family put extensive thought and effort into the decoration of their music room, which is filled with cultural delights, ranging from an English replica scale model of the royal carriage commemorating King George VI to a Japanese lacquer apothecary cabinet. Chinese palace vases and cane chairs sit by the fireplace, and Chinese rugs are scattered across the floor. Having such a room in their home was important to the Gibson family, as a way to show their guests exactly how worldly and cultured they could afford to be. Dobney, Jayson Kerr. “Nineteenth-Century Classical Music.” In Heilbrunn Timeline of Art History. New York: The Metropolitan Museum of Art, 2000–. (October 2004). Hogstad, Emily. “Madame Norman-Neruda and a Short History of Women Violinists, Part I.” Violinist.com. June 01, 2010. “Victorian Music Room.” Victoriana Magazine. Until the end of the nineteenth century, most American children were dressed like miniature adults. Prior to age three, boys and girls alike wore “dresses,” or long shifts that were simple to get on and off and easy to launder. At about three or four, girls began wearing more elaborate dresses, like their mothers, and boys were “breeched,” or put into pants, like their fathers. Beginning in the 1860s and 1870s, however, specific clothing for children became popular. And one of the most popular, and enduring, outfits for young boys was the sailor suit. Queen Victoria dressed the Prince of Wales, Edward VII, in a custom-made sailor suit in 1846, modeled on a real Royal Navy uniform. The prince’s portrait was painted in this outfit and it set off a craze for sailor suits that would last into the twentieth century. The Gibsons were not immune to this popular style of dress. The Museum owns two sailor suits, one navy and one white, which belonged to cousins Henry Allen, the son of Mary Ethel Gibson Allen, and Warren Winslow, the son of Rosamond Gibson Winslow. The cousins were quite close, and it’s easy to imagine them scampering through the house in their matching outfits while sisters Rosamond and Mary Ethel came by to visit with their mother. The sailor suit may have been a popular choice because the central pieces—a middy blouse and long pants—were easy to wear and relatively comfortable for children’s play. That’s in contrast to some of the other popular clothing for young boys at this time period. Fauntleroy suits, inspired by the 1885 novel Little Lord Fauntleroy by Frances Hodgson Burnett, included matching velvet suit jacket and pants and a shirt with an elaborate ruffled collar. 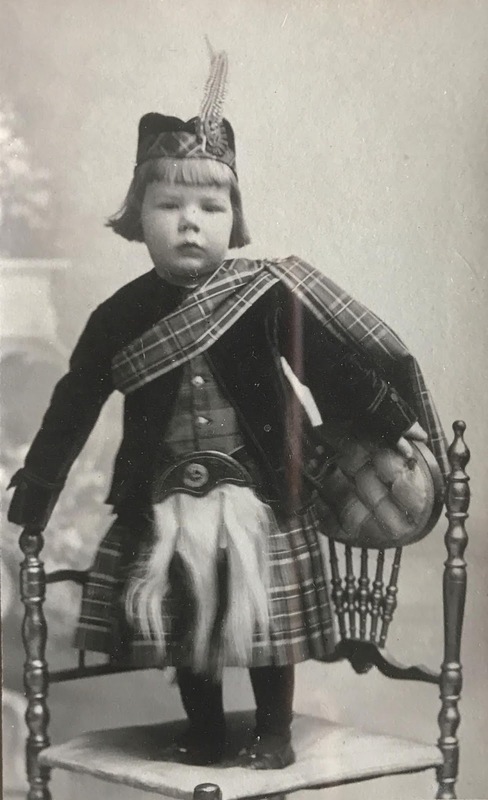 Scottish Highland costumes, again popularized by Queen Victoria and her children, were modeled on traditional Scottish dress and included a kilt, waistcoat, jacket, plaid, and cap (and often matching socks and capes, as well). The Scottish suit on display at the Museum was loaned by Sam Duncan, Gibson House Museum Board President, and was worn by many generations of the Hammond and Duncan families. Both Fauntleroy suits and Scottish costumes would have been worn in more formal settings. The sailor suit, a more casual look and easier to reproduce, remained popular well into the twentieth century, for both girls and boys of all social classes. The sailor suits and Scottish costume will be on display at the Gibson House Museum through February 25, 2019. Visit the Gibson House Museum website to plan your visit!